The atoms of all Group 14 elements have four electrons in their outermost energy level. In spite of this fact, the elements have less in common physically and chemically than do the members of most other families of elements. Carbon was one of the first elements known to humans. A Greek historian of the fourth century B.C. , for example, tells of a natural gas well in Turkey that provided a perpetual flame for religious ceremonies. Many reports also detail the practice of mixing lampblack, a form of carbon, with olive oil and balsam gum to make a primitive form of ink. 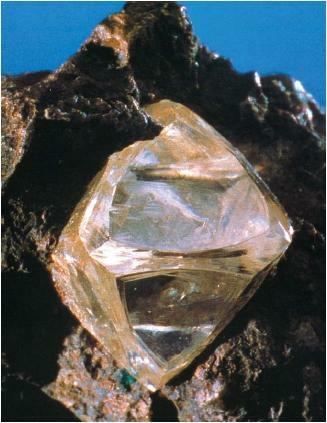 And diamonds, another form of carbon, are described in the Bible and even older Hindu manuscripts. Carbon occurs both as an element and in combined forms. As an element, it exists in at least three different allotropic forms. (Allotropes are forms of an element that differ from each other in physical and, sometimes, chemical properties.) The two best known allotropes of carbon are graphite and diamond. Graphite is a soft, shiny, dark gray or black, greasy-feeling mineral used to make the "lead" in lead pencils. Graphite is soft enough to be scratched with a fingernail. The second common allotrope of carbon is diamond. 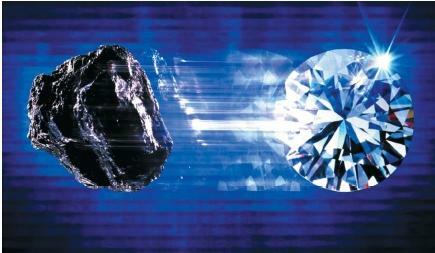 In striking contrast with graphite, diamond is the world's hardest natural material. Its ability to bend and spread light produces the spectacular rainbow "fire" that is often associated with diamond jewelry. Skillful gem cutters are able to cut and polish diamonds in a way that maximizes the effect of this natural property. In 1985, a third allotropic form of carbon was discovered. It is a 60-atom structure called buckminsterfullerene that looks like a soccer ball when viewed under a microscope. How would you like to have a molecule named after you? That is just what happened to one famous American in 1985, when scientists discovered an entirely new form of carbon. Until that time, chemists had thought that carbon existed in only two solid forms: graphite and diamond. Then, researchers at Rice University in Texas and the University of Sussex in England found a strange-looking molecule consisting of 60 carbon atoms joined to each other in a large sphere. Under a microscope, the molecule looks like a soccer ball with 20 hexagons (six-sided figures) on its surface. The Rice and Sussex chemists suggested naming the new molecule after American engineer and philosopher R. Buckminster Fuller (1895–1983). Fuller had created a number of exciting new architectural forms, one of which was the geodesic dome. A geodesic dome, like the new molecule, is a sphere made of many plane (flat) figures like the hexagon. Because of this similarity, the new molecule was given the name buckminsterfullerene or, more briefly, fullerene. Less formally, the molecules are also known as bucky-balls. The discovery of fullerenes has created a whole new field of chemistry that involves the study of "hollow" molecules in the shape of spheres or cylindrical rods. 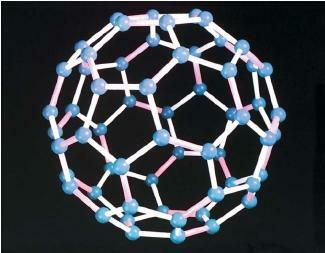 In the early 1990s, astronomers announced the discovery of fullerene molecules in outer space. Carbon also occurs in a number of common compounds. Carbon dioxide, for example, is the fifth most abundant gas in the atmosphere. It makes up about 0.3 percent of the total volume of all atmospheric gases. Calcium carbonate is one of the most abundant of all rocks in Earth's crust. It occurs in a wide variety of forms, such as limestone, marble, travertine, chalk, and dolomite. Stalactites and stalagmites in caves are made of calcium carbonate, as are many animal products, such as coral, sea shells, egg shells, and pearls. Carbon exists abundantly in Earth's crust in the form of the fossil fuels. The fossil fuels are coal, oil, and natural gas. They have been given this name because they were apparently formed—in the absence of oxygen—by the slow decay of plant and animal forms that lived millions of years ago. More than ten million compounds of carbon are now known. That number is far greater than the total of all noncarbon compounds that have been discovered. The special property that makes carbon so different from all other elements is the ability of its atoms to combine with each other in long chains. It is possible to find compounds in which two atoms of an element are joined to each other, but chains of more than two are rare. A chain of ten or more atoms (other than carbon) is virtually unheard of. Yet long chains of carbon atoms are the rule rather than the exception. For example, the protein molecules in your body consist of hundreds or thousands of carbon atoms connected to each other in a long chain. Furthermore, carbon atoms can form structures more complicated than chains. Some compounds have carbon chains with other chains branching off from them, carbon chains joined tail-to-end in rings or rings inside of rings, carbon chains in the shape of cages, boxes, and spheres, and carbon chains in other strange and fascinating shapes. The interesting point is that these strange molecular structures are not just laboratory curiosities. In many cases, they are found in some of the most important compounds in living organisms. Silicon is the second most abundant element in Earth's crust after oxygen. It makes up about 27.2 percent of the crust by weight. In the universe as a whole, silicon is the seventh most abundant element, after hydrogen, helium, carbon, nitrogen, oxygen, and neon. Silicon never occurs free in nature; except for rare occasions, it is found in combination with oxygen. Probably the best-known and most important mineral of silicon is silicon dioxide. Silicon dioxide occurs in two forms: a crystalline form known as quartz and a noncrystalline form known as flint. Quartz itself appears in a variety of forms, perhaps the best known of which is sand. Other than silicon dioxide, the most common forms of silicon in nature are silicates, compounds that contain silicon, oxygen, and other elements such as magnesium, aluminum, calcium, and phosphorus. Some familiar silicates include asbestos, beryl, various types of clay, feldspar, mica, talc, and the vast majority of gemstones, including emeralds, sapphires, and rubies. The commercial product known as Portland cement also consists largely of silicates. Uses. Various minerals of silicon have long been used in human societies for two purposes: in construction and in the manufacture of glasses and ceramics. Many natural building materials—brick, clay, and sandstone, for instance—are made of or contain silicate materials. And a very wide variety of glasses and ceramics are made by combining silicon dioxide or silicates with other blending materials. Silicon itself also has many important uses. It was one of the first materials to be used in the manufacture of semiconductors and is still in demand for that application. (Semiconductors are substances that conduct an electric current but do so very poorly.) It is also used as an alloying agent with metals, particularly to increase the strength of a given alloy. Another application of silicon is in the manufacture of certain plasticlike materials known as silicones. Silicones consist of silicon combined with a variety of organic materials. Low-molecular-weight silicones are oils that make good lubricants; they stand up better to high and low temperatures than do petroleum oils. High-molecule-weight silicones are known as silicone rubber. Silicone rubber is used in a variety of ways—in everything from super-bouncing balls to bathtub sealers to spaceship parts. The first human footprint on the Moon was made with a silicone-rubber-soled boot. In between silicone oils and rubber are hundreds of kinds of silicones used in electrical insulators, rust preventives, soaps, fabric softeners, hair sprays, hand creams, furniture and auto polishes, paints, adhesives, and chewing gum. Germanium has earned a place in the history of chemistry as the element predicted to exist by Russian chemist Dmitry Mendeleev (1834–1907) in 1871. Mendeleev's ability to predict the properties of the as-yetunknown element simply because of its place in the periodic table was a remarkable accomplishment. Not only did it lead to the search for the element but it also convinced chemists that Mendeleev's scheme for organizing the elements was a valid one. Germanium metal is a dark gray solid with a metallic luster. Its melting point is 937.4°C (1,719°F), and its boiling point is 2,830°C (5,130°F). Germanium sometimes occurs as a pure metal in combination with more abundant elements and as germanium oxide. The element is not very abundant in Earth's surface, occurring to the extent of no more than 1 to 2 ppm (parts per million). By far the most important application of germanium is in the manufacture of semiconductors. The addition of small amounts of impurities such as arsenic, phosphorus, and gallium greatly increases silicon's conductivity and its value in electronic devices such as transistors. Tin is one of the first metals to have been used by humans. The earliest written records date to about 3500 B.C. , when tools and weapons made of bronze (an alloy of tin and copper) were in general use. In fact, the success of bronze for these applications gave the period a name by which it is now well known, the Bronze Age. Tin is not a particularly abundant element in Earth's crust, ranking forty-eighth among the elements. It follows bromine and uranium and precedes beryllium and arsenic in order of abundance. It occurs primarily in the form of the mineral cassiterite, an oxide of tin. Tin occurs in two allotropic forms at and near room temperature. One form is a silvery-white metallic material that is both ductile (capable of being drawn out into a fine wire) and malleable (capable of being rolled or hammered into thin sheets). It is called white tin and has a melting point of 232°C (450°F) and a boiling point of 2,260°C (4,100°F). The other form is a brittle powdery solid known as gray tin. An interesting illustration of these two forms of tin occurred in 1850, when temperatures in Russia dropped below freezing for an extended period. Objects made of tin—including buttons, organ pipes, and drinking cups—changed from stable white tin to fragile gray tin. These objects crumbled and fell apart as temperatures continued to hover around the freezing point. Uses. Tin is too soft and fragile to be used by itself. Its applications almost always involve a blending of the metal with one or more other metals. For example, its most important application is in tin-plating other metals. Tin is applied to the surface of iron or steel to provide a nontoxic, corrosion-resistant product. Alloys in which tin is used include solder, bronze, Babbitt metal, pewter, and type metals. Lead is another metal that has been known to humans for thousands of years. It was used for making pottery glazes in Egypt as early as the seventh millennium B.C. , as roofing and flooring in Babylonia, and for water pipes and other types of plumbing in ancient Rome. This metal is by far the most abundant of the heavy metals with an occurrence of about 13 parts per million in Earth's crust. It occurs most commonly as the black mineral galena (lead sulfide). It also occurs in angelsite (lead sulfate), cerussite (lead carbonate), pyromorphite (lead phosphochloride), and mimetesite (lead arsenochloride). Lead is a dull, gray, soft metal with a density of 11.342 grams per cubic centimeter. Its density is about twice that of tin and five times that of silicon. Its melting point is 327°C (621°F), and its boiling point is 1,751°C (3,184°F). Uses. The uses of lead have changed dramatically over the past half century because of discoveries about its toxicity. At one time, lead was used in many applications that involved its entering the human body. For example, household plumbing devices and many kinds of pots and pans contained lead. When water passed through these devices or the pots and pans were used for cooking, small amounts of lead were dissolved and were consumed by humans. Today we know that lead has serious effects on the human body. It can cause damage to the liver, kidneys, and brain. It is especially harmful to young children whose mental development can be severely impaired by the consumption of lead-containing materials. These health effects have dramatically changed the pattern of lead use in the United States and many other parts of the world. In the first half of the twentieth century, lead was widely used in house paints and in leaded gasoline. Today, both applications of lead have been banned in an attempt to reduce the exposure of humans to the metal. Instead, more than half of all the lead produced today goes to the manufacture of lead storage batteries used in cars, trucks, and other vehicles. The lead is used to produce the two electrodes used in such batteries. The disposal of lead storage batteries (once they are no longer usable) continues to be an ongoing environmental problem in many parts of the world. Lead can also be found in a variety of alloys, such as solder and type metal; limited-use paints and pigments; in certain types of glasses and ceramics; in the production of special-use pipes, tubes, sheeting, and lead foil; and in protective coatings for cables. Due to its giant covalent structure, diamond is one of the strongest materials on the earth. Diamond can only be cut with diamond. It has a very high melting and boiling point, as it needs so much energy to break down all the covalent bonds. i luv the beatiful color of the diomaond and i also like other cool things about the dimond and i also like differnt way that they wrer and also we had fun mixing the dirernt styles. What is the main important things of Carbon and other things. I am kind of confused of this strange concept.